Individuals from MSI, RedHat Inc., Intel Corp., Indiana University (Jetstream), Laureate Institute for Brain Research, University of Michigan Advanced Research Computing Technology Services came together at SC16: The International Conference for High Performance Computing, Networking, Storage and Analysis on Wednesday, November 16, 2016 in Salt Lake City, Utah to share their experiences with Ceph in HPC Environments. This "Birds of a Feather (BoF)" meeting is bringing together Ceph developers and systems administers to share their experience working with Ceph and to discuss how it can be used to address many of the challenges that we now associate with Big Data and data intensive research. The format for this BoF is a series of six lightning talks. Each talk will be about 10 minutes, followed by three minutes of questions. 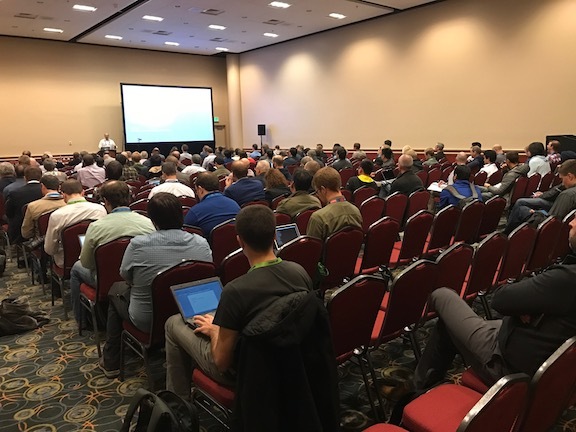 Researchers, developers, and administrators are welcom to come and participate in this session and to share and learn about Ceph in the wild. Douglas Fuller, Red Hat, Inc.
Bio Sketch: Douglas Fuller has been a Ceph engineer at Red Hat, Inc. since 2015. Prior to joining Red Hat, Doug worked at Oak Ridge National Laboratory Oak Ridge Leadership Computing facility, working on design and implementation of some of the world’s largest and fastest scalable data storage systems. He holds bachelor’s and master’s degrees from Iowa State University, studying programming models and languages for high performance computing. Bio Sketch: William Magro is an Intel Fellow and Intel’s Chief Technologist for HPC software. In this role, he serves as the technical lead and strategist for Intel's high-performance computing (HPC) software and provides HPC software requirements for Intel product roadmaps. Magro joined Intel in 2000 with the acquisition of Kuck Associates Inc. (KAI). Prior to KAI, Magro spent 3 years as a post-doctoral fellow and staff member at the Cornell Theory Center at Cornell University. Magro holds a bachelor's degree in applied and engineering physics from Cornell University and a master's degree and Ph.D. in physics from the University of Illinois at Urbana-Champaign. Bio Sketch: For his Ph.D. work, Ben developed computational methods used for thermochemistry and thermochemical kinetics simulations. After joining MSI, he has led numerous projects in software development and new technology deployment. Bio Sketch: John (Mike) holds a BS computer engineering degree from Purdue University. He has worked in high performance computing and virtualization at Indiana University for 10 years. Bio Sketch: Brady Deetz is the head of IT for the Laureate Institute for Brain Research, a clinical neuroscience research institute in Tulsa, Oklahoma. At LIBR he is responsible for research computing and data storage in support of multidisciplinary research programs in neuroimaging, behavioral health, and biochemical measures. Key cyberinfrastructure resources include petascale tape storage; a petascale disk (Ceph) resource, and local compute servers. Bio Sketch: Started working at University of Michigan in 2007 for the ATLAS Great Lakes Tier 2 computing center. In 2016 moved to UM Advanced Research Computing to be OSiRIS lead engineer. Bio Sketch: Founder and chief architect of Ceph, a distributed storage platform. He also was the creator of WebRing, a co-founder of Los Angeles-based hosting company DreamHost, and the founder and CTO of Inktank. Sage now works for Red Hatas the chief architect of the Ceph project. Weil earned a Bachelor of Science in computer science from Harvey Mudd College in 2000 and completed his PhD in 2007 at the University of California, Santa Cruz working with Prof. Scott Brandt on consistency protocols, data distribution (CRUSH), and the metadata manager in the Ceph distributed file system. In 2014, he won an O'Reilly Open Source Award.